I do not delete this post because I think is good to show that making mistakes is a part of the though process. Ideas come gradually and they need to be review constantly. Etymologically “Prime” comes from the Latin “Primus” which means “the first”. “Primary” comes from the Latin “primarius”, from “primus”, with the same meaning. We speak about “Primary colours” with the original meaning of the first, fundamental or basic colors. And we speak about “Prime numbers” but I do not know if its original meaning has been lost or forgotten. I consider that prime numbers are primary in the same sense attributed to primary colours. If we think about number 3 like a yellow colour and number five like a red colour, we will name orange to the secondary colour formed by the multiplication of 3 and 5. But we cannot consider the number 9 as a different colour from the yellow. It is formed by three yellow numbers 3. It is not a secondary number in the sense of the 15. In the same sense 27, 81 and any odd number formed by 3 raised to the power of n.
We cannot divide the yellow number 3 by other numbers, but we can divide the number 9 by one or two numbers 3. Thinking about numbers as the measuring or signaling of space, we can consider the number 9 like a number 3 that unfolds two times. It can be folded again. In a more strict sense, without considering infinitesimal, only the number 1 is prime in the sense of primary. The frequency and distribution of prime numbers depend, in my opinion, on the topography of the space that we take as reference. Modifying the shape of space, introducing irregularities, multi and interdimensionality, mirror symmetries, or periodical variations, would affect to their spatial distribution and frequencies. I made this table looking for “first odd numbers”. It shows some kind of irregular pattern at the vertical level. It has 15 columns and numbers are distributed in threes at the horizontal lines and thirty to thirty at the vertical ones. Apparently (in fact I still have not found) there is not a pattern that explains why some of the blue columns are not prime numbers. Should all numbers on blue columns be prime numbers too? I think yes. The unique primary number that forms all numbers is the number one, so I think it there should be symmetry. I guess by intuition that numbers that I expected should be prime, are numbers that have lost their expected primary nature because of the effect of other numbers. Numbers, at least on this case, are symbols that we use to signal a space. And they all are formed by the number 1, following the number 1 we have to see when a new number is created. Greek people experienced panic when they discovered irrational numbers. They broke the expected measure and symmetry, and for some time they were not considered as numbers. I imagine that it would be necessary to look for all numbers one implied. To look where the symmetries that could affect or adulterate to the expected nature of those non prime numbers are broken. 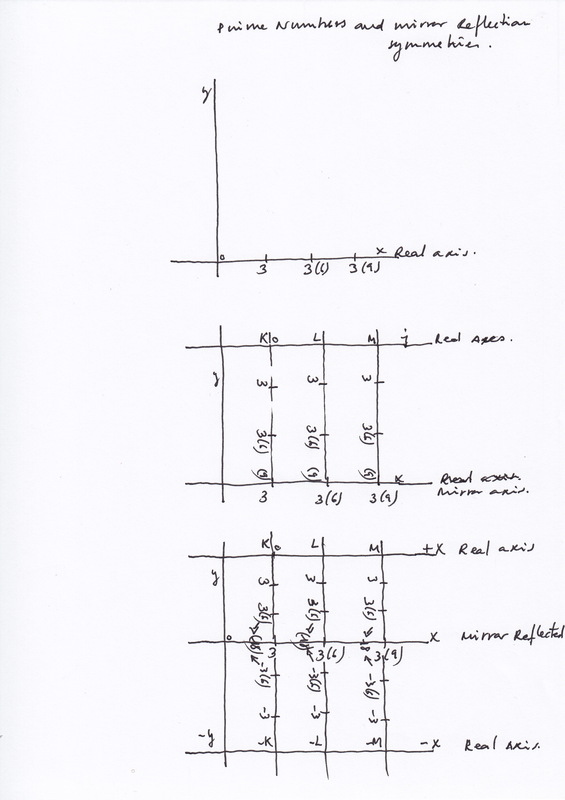 Maybe mirror symmetries, imaginary numbers for real ones. I do not know but I suspect that there is a pattern that I still can not see on the table. If we continue the figure, at the line 28 it starts a bigger asymmetry and some non prime numbers start to occupy the blue columns, displacing toward the right side. For other spatial prime numbers’ distributions you can look for Ulam’s spirals. On the previous post I came to the idea of a spiral distribution too, following the idea of the atomic number that I am defending on this blog. In the case of mirror symmetries, the consideration of what numbers are prime will depend on what is our reference point. A space can be real or mirror reflected depending on the perspective of the observer and their reference’s point. Multidimensional spaces are real and mirror reflected (imaginaries) at the same time. A number 3 can be prime for an observer but it can be a 9 or a 18 for others at the same time. In the case of periodical variations of space, a spatial point represented by a non prime number, for example a number 9, could became a prime number, for example a 3, and viceversa, successively. Although I still do not have the whole picture and move into the realm of intuitions, I think geometry of space rules prime numbers. 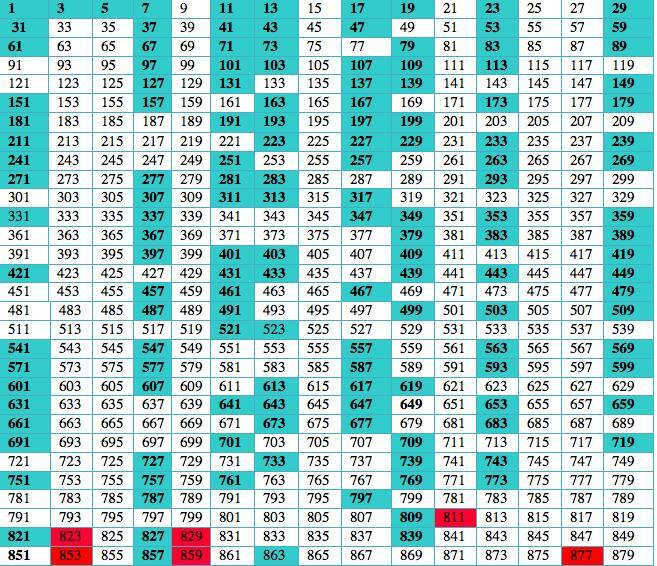 All prime numbers greater than 5 should be in the blue columns. 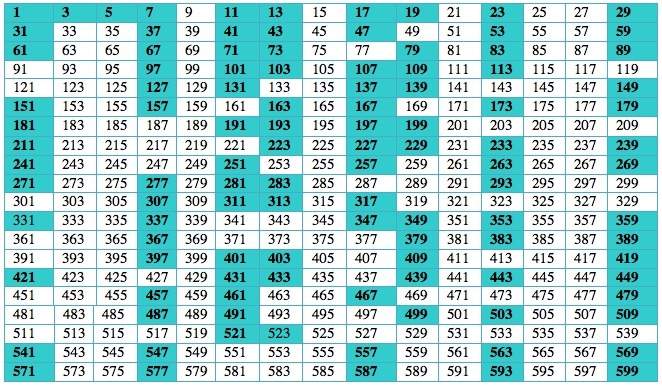 The reason why some primes are not in the blue columns in your second grid is because you made an error and put the numbers from 781 to 799 twice. If you correct this, then all primes will be in the blue columns. I think the post I wrote is not useful at all to explain prime numbers, but it was one of my first attempts to explain them. I added a note mentioned it at the beginning of the post: I decided not to delete the post to show how I develop my thoughts gradually, making mistakes, reconsidering what I previously said, etc. That’s the way I avance.